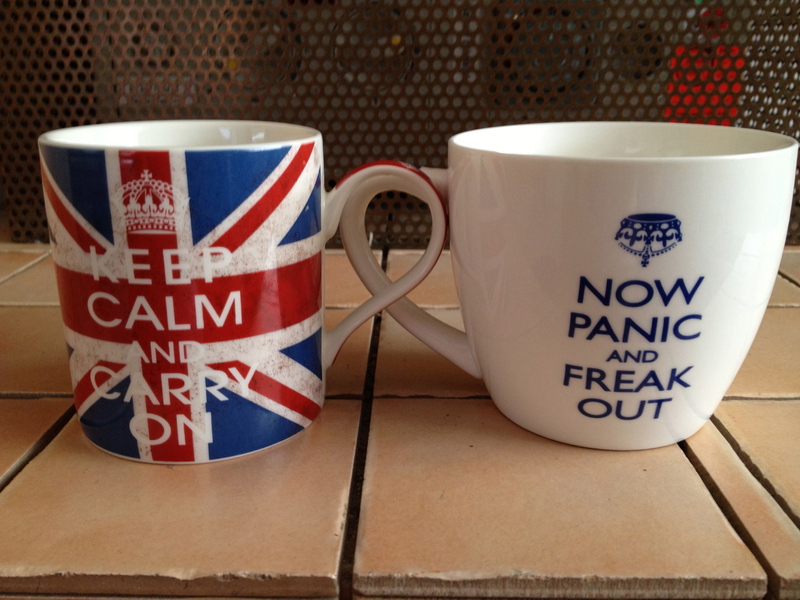 It was one of those days where I didn’t quite know which mug to use. Last night I couldn’t sleep. Yesterday it was hard to teach. I sat stewing, angry with myself for letting it get to me. I was angry with myself for letting someone’s opinion of me (someone I don’t even know) push me to this point of angst. I dubbed last week “Planning for Hitler.” I was deeply embroiled in planning lessons on the weaknesses of the Weimar, how international entanglements put Germany’s economy at risk, and why 37% of a population would vote for a man whose name is now synonymous with evil. I was doing my best to create classroom activities that helped students to not blame but to see life as it was back then. This is a subject I have taught before, but as with any class I teach, the students always challenge me in what I know and understand about a subject. Students share their own family stories, their disbelief, their naiveté, and their sometimes silly and simplistic comparisons as they struggle to make sense of it all. I try to model for my students life long learning. And when they ask a question that I don’t have answers to, I challenge them to find the answer. I challenge myself to use those resources I trust to find the answers as well. Then we come back to class and share what we have discovered about that question or dilemma. This week I heard a new question. “Did any Jews vote for Hitler?” Wow. I was speechless. Great question. I could have made assumptions. I could have spewed out hearsay but instead I tried to find the answer. I scoured statistics on the Internet. I skimmed through doctoral theses. I found nothing. So I went to a source of information that I trusted, an acquaintance that helps run a Holocaust education center back in the states. She also was intrigued by the question however could offer me no answers. So she sent my question along to a person who she believed to be an expert on the subject of Nazi Germany. The response from the expert was then forwarded back to me. I don’t think it was intended for me to read. Instead of a being offered voter statistics from 1932, I was offered a lesson on how to teach this delicate subject as well as a critique of what I seemed to be teaching. It called me “careless” and said I made “poor attempts”. It placed judgment on my abilities as a teacher but begged me not to judge the German people for being bystanders to the crime. It showed no regard for my background, my life experiences, or my experience as a teacher. I deleted my reply. I decided that writing a letter to this person would do me no good. And who cares about this guy anyway? I will never meet him. I will never speak to him. I don’t know him and he obviously, from his response, does not know me. But then I caved to my ego. I wrote a response. I stated that “You probably didn’t mean to insult me but…” I listed my qualifications, my family background, and my life experiences. I tried to show him that he had misjudged my character and my abilities. And then I thanked him for his “expert” response. I sent the email and immediately regretted it. I felt sick about it. I lay awake rewriting my response in my head with more and more excellent examples. I should have talked about Eva and how she had to walk over charred bodies to escape the burning city in 1943. I should have talked about my experiences at Wansee and how I prayed I would not recognize any faces in the pictures I saw before me. I kept reminding myself that arguing with someone you don’t know and will never meet is just plain stupid. I tried to calm myself with “Who cares about this person? Don’t be bothered by it. Don’t let it get to you.” But it bothered me; it got to me. And isn’t this where I began my week? Trying to get my students to not pass judgment on a group of people who voted for and supported a man who perpetrated one of the most heinous crimes in history. Weakness, judgment, reputation, ego, mistakes, misunderstanding, misinterpretations, assumptions, allies, enemies. These are the things that start and sustain wars. These are things that are so much a part of our humanness, regardless of the time in which we have lived. Yet these are the things that are at the root of so many crimes against humanity. The expert wrote me an apology, sort of. “If I would have known you were going to read my response, I would have worded things differently in a few places.” The judgment is still there, just worded differently. Have you ever been successful in arguing with someone on the Internet? Have you ever been so bold as to not respond? I wish I could be a student in your classroom. What a fascinating topic! I do love my job. And I couldn’t do it without the help of good people resources. Thanks for the complement. please stop punishing yourself. there isn’t always dignity in silence. you are brave. All ended well. I wrote to another “expert” on a different topic. The Dr. from Max Plank Institute was sorry he would be unable to Skype in with my class about their recent discovery about a new Hominid. But then he ended the email with…teachers are much better at explaining this stuff to kids than researchers. He has all the answers but graciously deferred to the classroom teacher. Wow. Hmm, now that’s a really fascinating question about Jews voting for Hitler. Considering that many Jews believed themselves to be sufficiently assimilated and integrated into German society (and that’s why many stayed in the country even after Kristallnacht) – I suspect that a fair number of Jews probably did vote for Hitler along with ethnic Germans. Did this “expert” ever provide any meaningful answer, beyond comments on your teaching style? This was interesting. It could well be that large majority of Jews voted yes on that ballot, judging by a couple of the Jewish districts the article mentioned. While I was teaching at a junior high school in Japan, I was a member of an online forum for other expats in Japan. It was a pit, and people would “pile” onto people who showed signs of weakness. One of the members took a dislike to me the second I joined and would type out sick insults every time I replied to something, which still is with me today as one of his close friends works in my office and treats me in a similar manner (minus the insults) to my face. Some people are just too good at replying in a way that will keep you awake at night wondering how to deal with them. I’m very much like you and find that I need to explain myself each time but it rarely works out for me. I think what is the most frustrating to me is the battle within myself. Why do I let these people get to me? I don’t know them, they don’t know me. Forum bullies are a strange sort. Once in awhile I get board and travel over to Toy Town to see what is happening in the expat world. I am amazed at how heartless some people are. It is like they live to cut others down. This is the nature of communicating through a remote means… digitally, internet, etc. We can not read faces or hear tone. In this case you were correct in your assessment of the message being delivered. It is a clear case that knowledge and wisdom are not the same. You learned both from this experience. Thank you for passing on the reminder. 2) Does this need to be said right now? 3) Does this need to be said by me? The answer is almost always no. I’ve stepped away from wasting more time and energy this way. Good advice for sure. In the end, responding was the best choice. I think lessons were learned on all sides. And as a result of this post, I have had numerous resources sent my way on the topic I was looking for. Thanks so much! The last two days have been crazy. The Local did not contact me to say they were featuring me. I had to google my blog to see what all the traffic was from. Heh. That’s neat, though. “Sudden influx of new traffic” is not a bad thing. I’m often surprised at where new traffic comes from, though. My Deutche Bahn primer post gets a lot of traffic from an ICE train aficionado site, and I get a lot of random traffic on my post about Kinder Surprise Eggs being illegal in the US. Weird, neh? You will never be able to say for sure because the election is supposed to be secret, but most likely yes. One has to consider that the Jews were also Germans. And they were as prone to Nationalistic thinking as other Germans. One also has to consider that while Hitler wrote his book “Mein Kampf” early on, next to nobody had read it at this point (as Schwanitz so apt pointed out, it might be the only book in literature history which a had a big impact exactly because it was largely ignored). And one has to consider (which you most likely already know since you looked into the election numbers) that Hitler was not elected by a majority vote. More generally speaking…I think the issue is very complicated, way more complicated than people like to believe. I always think that it is the best not think about it as “Germans again Jews” but “Germans again other Germans”. Those Jews which died were (mostly) Germans, and they were by far not the only victims. They were just a practical “Feindbild”. In the end, it was mostly about “we against them”…and “them”, that were not just the Jews, it was the Sinthi, the communists, people with mental illnesses or disabilities, homosexuals, in short, everyone who was “different” and everyone who dared to speak up against the regime. It was “The Wave” on a large scale. And that’s why it is so important to understand the mechanisms behind it instead of generalizing. Because only when we understand we can avoid it happen again…as it happened multiple times beforehand and after on a smaller scale. And is still happening in certain countries.